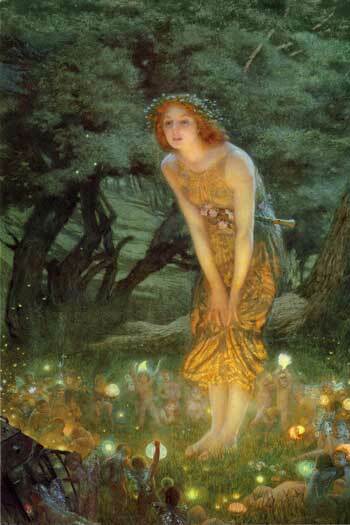 Midsummer Eve by Edward Robert Hughes, c. 1908. One of my favorite paintings. 1. Lightning Bugs. I'm a girlie girl. For me to like a bug of any kind is noteworthy. These magical creatures are among the few insects that I truly appreciate. With such short lifespans, I can't help but believe that they're put on this Earth for the beauty that they emit. When I start noticing lightning bugs (or fireflies as they are more commonly referred) in June, it's a cyclical comfort. 2. Longer Days. For someone who doesn't particularly like the Sun and is a night owl, this is a bit of a contradiction. But because I usually wake up much later than "normal" people, it's nice to be able to get up and still enjoy the daylight hours. Who doesn't like a sunset? 3. Ice Cream. French Vanilla is my favorite flavor. 4. Miniature Golf. Love this game. 6. Driving with the windows down and the music up. 7. The noticeable shift in temperature. On Summer nights when the cool air rolls in, it's a lovely reprieve. I loathe a heat wave but I live for a cold front. 8. Movies. Lots of great films are released in the Summer. A nice way to beat the heat on a hot afternoon. 9. Fireworks. Where I live, there's never a shortage of sparklers. 10. Summer Reading. Sitting in the shade and enjoying a good book. 11. Sunglasses. I wear these all year 'round but they're a definite necessity during Summer. 12. Concerts. There's always a good show to see. 14. Flea Markets, Garage Sales. 15. Iced Tea/Lemonade/Seasonal Beer... Anything with a refreshing kick. 16. Summer Nights. There's magic in the air. Star Gazing is always nice. 17. Weddings. Cliche to get married during this season but I can't knock tradition. 18. Parties. Bring on the jello shots! 19. Bonfires. One of my favorite things. Camping can be fun. 21. Vacations/Weekend Getaways. Trips to the amusement park (Kennywood forever!). 22. The smell of fresh cut grass. 24. Late evening walks in the park.